Chaka Demus – the rough one – and Pliers – the smooth one – thoroughly retool a pop standard but it’s hard to imagine anyone being annoyed (or thrilled) by the resulting jollities: “Twist And Shout” is the kind of song which is so often covered you’d think it can’t have purists anymore. It has survived dozens of styles and, for that matter, will endure its current life in reality show limbo. This particular version is all twist and very little shout – cheerful, almost languid, cantering along without any real spark but entertaining all the same. Musically it’s not taking many risks – there’s a lascivious intro from richer-voiced guest Jack Radics, a nagging backing yelp that sounds like a persistent terrier locked in the studio, and a twangy arrangement positioning the track as an “Oh Carolina” style blend of old and new. Pliers cajoles, his voice fluttering around Chaka Demus gruffer commands, but both men are more memorable elsewhere and their performance is a microcosm of the track: nobody does anything wrong, and somehow it fails to stick anyway. #29 Rotterdam Termination Source – “Poing” would be the record in question Rosie! ‘Poing’ is a landmark record, sure. I’d hesitate to use any positive adjectives, as it’s as objectively terrible as music gets, but you have to sort-of-admire how relentless and pointless it is. TOTPWatch. 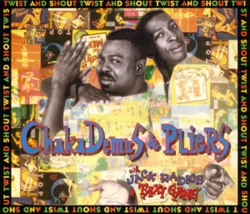 Chaka Demus & Pliers performed ‘Twist and Shout’ on Top of the Pops on 16 December 1993. Also in the studio that week were; East 17 and Take That, plus two live performances via satellite from Diana Ross in Paris and Haddaway from Disneyworld, Florida. Tony Dortie was the host. Rory all the way up at #5 had it about right – I’ve just watched the video in the early days of January on the coldest night in a while, and it does you good. Tuneful, fun, everyone’s having a ball, no-one’s getting dissed, and although there’s no great merit to the re-working, I’m sure the Isley Brothers wouldn’t mind – and you’d want to hit the dancefloor for it too. Don’t mind this, and today’s weather probably isn’t the most appropriate environment – but can’t give it any more than a 5. Why? Because the backing track sounds like someone doing the midnight boogaloo with a squirrel. I love how three #1 singles (Let’s Dance, the Masses Against the Classes and Can We Fix It?) all borrow the Twist and Shout intro, but when Twist and Shout finally gets to #1 itself, that intro is nowhere to be found at the start (it does crop up mid-way through IIRC).